Meg's Boutique: NOTD- Christmas sparkle! 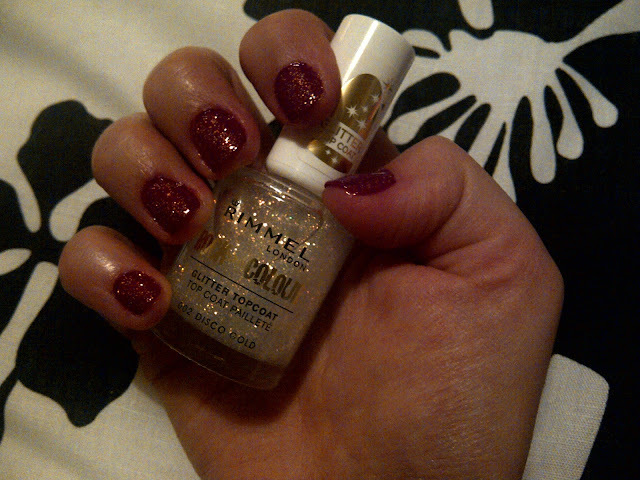 I fancied adding a little bit of Christmas sparkle to my nails this week so I invested in a Rimmel London glitter top coat in disco gold and put it on top of my No7 stay perfect nail colour in Foxglove. The deep purple and glittery gold remind me of Christmas baubles, which is a look perfect for the festive season. I don't know why it's taken me so long to invest in a good glitter top coat actually, as it's such a good way to spice up nail colours that your bored of. This particular one was £4.59 from Boots and I'm really impressed with it as it lasts ages and has just the right amount of glitter to be noticeable but also let the base colour show. How will you be painting your nails for Christmas? Are you a fan of glittery polish? I hope you've all had a Merry Christmas Eve-Eve!